Become pro-active in the environmental solution by contacting us about the complete line of Green Seal Certified and Bio-Renewable products from Spartan Chemical. Our account representatives can help you maximize the number of points your facility maintenance program contributes to achieving a LEED Certified building. 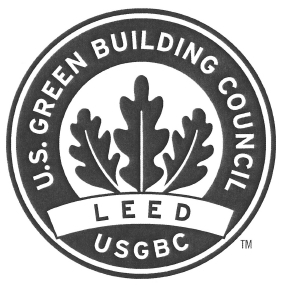 Contact us to see how we can help you gain up to 14 points toward your LEED goals. Lansing Sanitary Supply, Inc and Indusco Supply Company, Inc are Members of Triple S, a nationwide organization of janitorial and sanitary supply distributors. Our Membership in Triple S allow us access to the GSA schedules under their corporate name "Standardized Sanitation Systems, Inc.". The patented OmniFlex Dispense-and-Vac system from Kaivac offers a practical yet extremely effective alternative to mopping. Designed to remove the maximum amount of soil in the most cost-effective manner possible, the OmniFlex Dispense-and-Vac will allow you to finally 'Drop the Mop' once and for all. 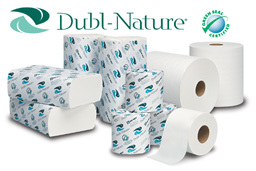 Dubl-Nature® Green Seal-certified products offer superior quality with a stylish and sophisticated appearance. Featuring a consumer-like embossing pattern, these products are made from a superior grade of 100% recycled wastepaper for exceptional brightness and absorbency. These products meet or exceed the U.S. EPA guidelines for post-consumer waste and are processed chlorine free. The PVR390 is in a class of its own! 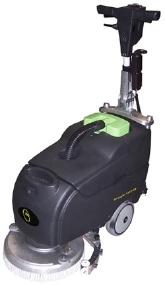 This is the first canister vacuum to include ON-BOARD STORAGE for more than just standard vacuum tools. The new AUTOSAVE feature automatically starts the vacuum motor on low speed, REDUCING POWER CONSUMPTION by 50% while only reducing suction by 25% and the upgraded switch housing is conveniently located at the front of the vacuum for easier operation. Ergonomic design, simple operation and a compact body make the Wrangler 1503 AB the best value in micro scrubbers. Designed for applications less than 10,000 square feet, this Wrangler is perfectly sized for restrooms, convenience stores, and nursing home rooms. They are also ideal for larger facilities with confined ares, such as grocery store checkout aisles, school cafeterias, commercial kitchens, and hospital rooms. Don't get bogged down by the weight of the job. Get around it. Welcome to the LSS Inc. website! Our headquarters is located at 1445 South Washington Avenue in Lansing, MI, and our Western Michigan branch, Indusco Supply Company, is in Kalamazoo and located at 3645 Cork St.
Our goal is for this site to become the primary source of information for our partners and prospective partners to get information about LSS Inc. We still want to visit you at your facilities to learn about your needs, and we want you to come to our house to see what we are about, but we would like this to be a way to put all the information that comes to us into a place where you, our customers and partners can use it and benefit. Most importantly, we want your feedback about what you would like to see on the site so please use the contact link or give us a call.